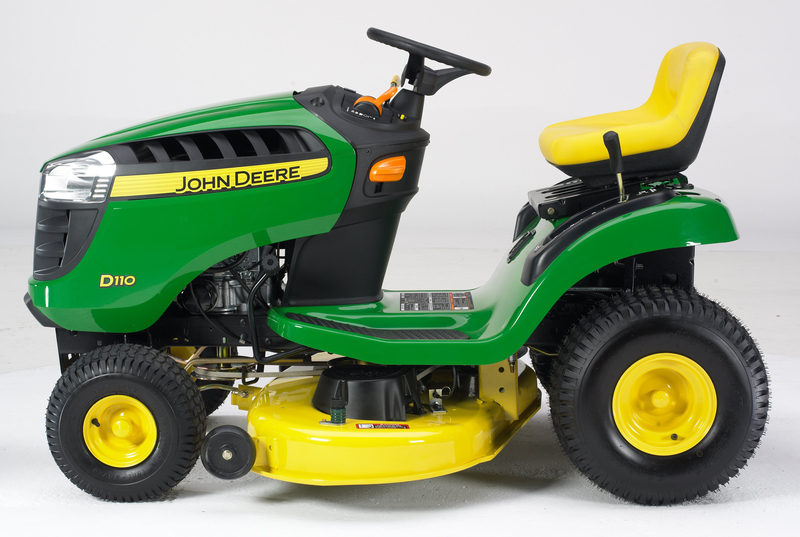 D110 is a most affordable hydrostatic transmission Riding Lawn Mower model of John Deere. 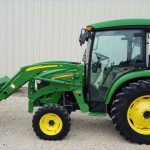 It contains 19.5 HP engine, 42-inch cutting deck, 2 cutting blades, hydrostatic drive, storage compartment, 2 years or 120 hours limited warranty. 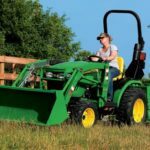 John Deere D110 will provide you quick starts, reliable and two-pedal foot controls for easy forward and reverse operation. The mower deck has superior cut quality and is ready to side discharge, and easily equipped to mulch or bag. 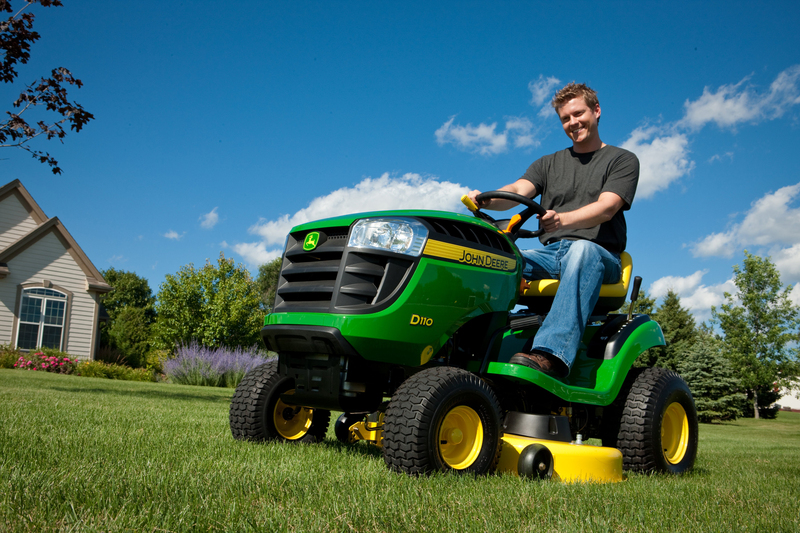 The John Deere D110 has top speed is up to 5.5 MPH. 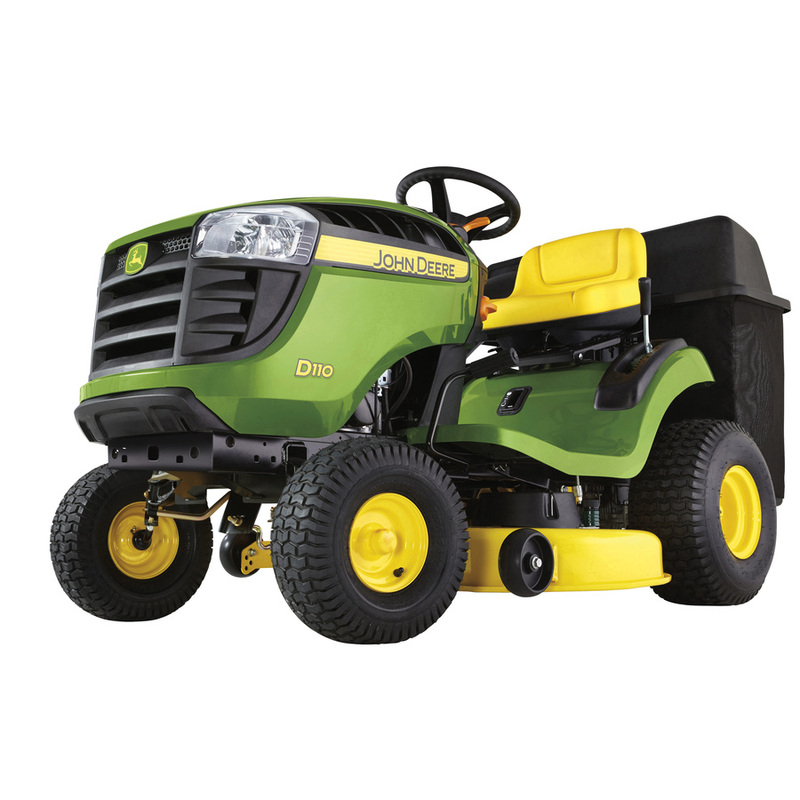 John Deere D110 is Easy to own at the affordable price of $1,699.00* USD and is Easy to operate. Easy to maintain. 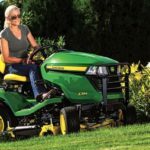 John Deere’s D110 model is the best choice for grass mowing up to 1 acre of grass area and it can be equipped with a number of accessories such as mulch kit, grass bagger, snow blade, snow blower and much more for the particular operation. 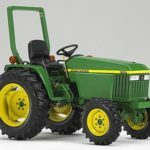 Also Read: John Deere 318 Garden tractor. 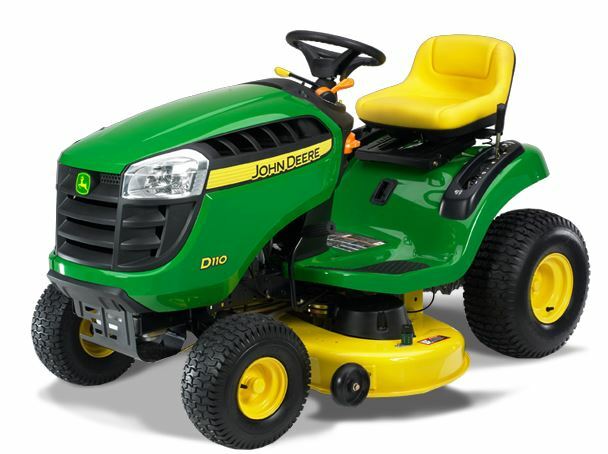 Price of the John Deere D110 lawnmower is very affordable. The price of D110 is $1,699.00* USD and it is good in value for money. Two years or 120 hours, whichever occurs first. The D110 has sufficient features including 11.9% more storage space, stronger hood pins, improved steering system that reduces tire and ground surface wear, improved headlights for maximum visibility and with 2 years warranty. 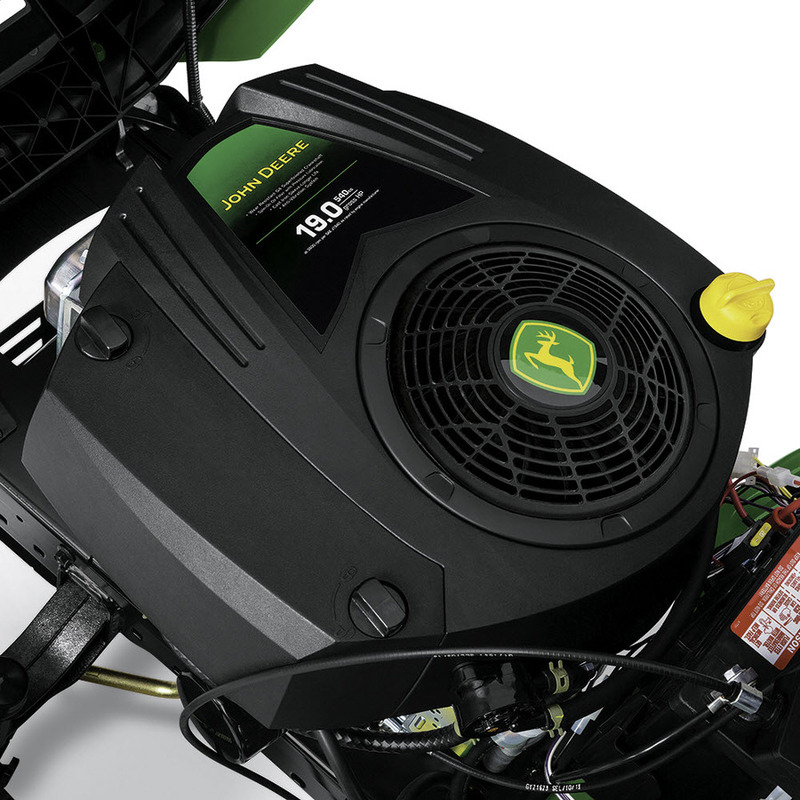 D110 is powered by powerful 19.5 HP Briggs & Stratton engine equipped with the patented anti-vibration system. Its two-pedal foot control is controlled by hydro-transmission. It can move up to 5.5 MPH forward speed and reverse speeds up to 3.2 MPH. Maintenance cost of D110 is very low because of full-pressure lubrication and oil filter for cleaner oil, sustainable engine life and extending the time between oil changes. 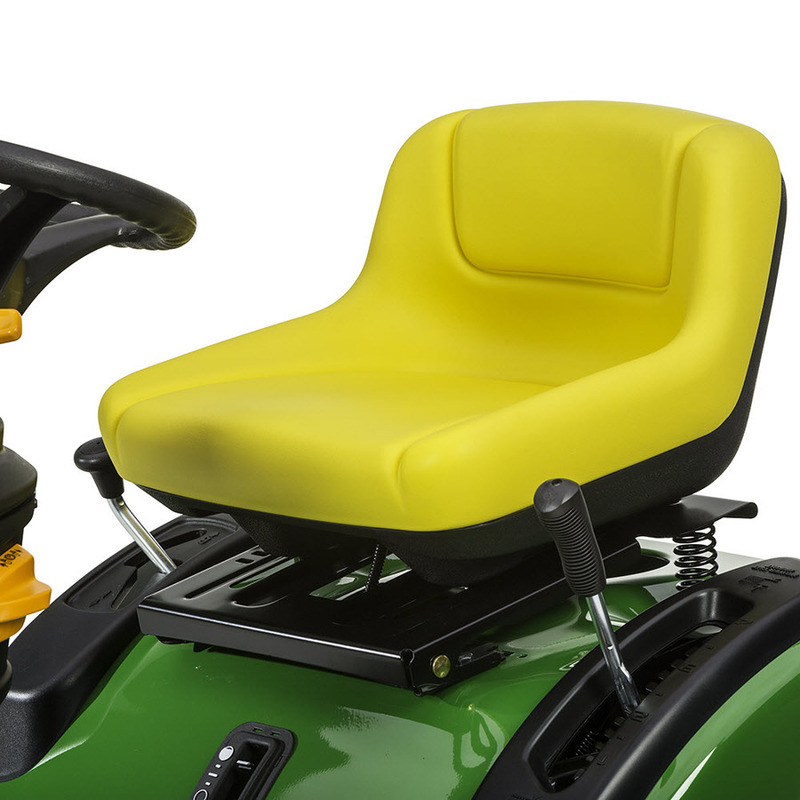 In the cutting system of D110 is equipped with Mower Deck with The Edge Cutting System. 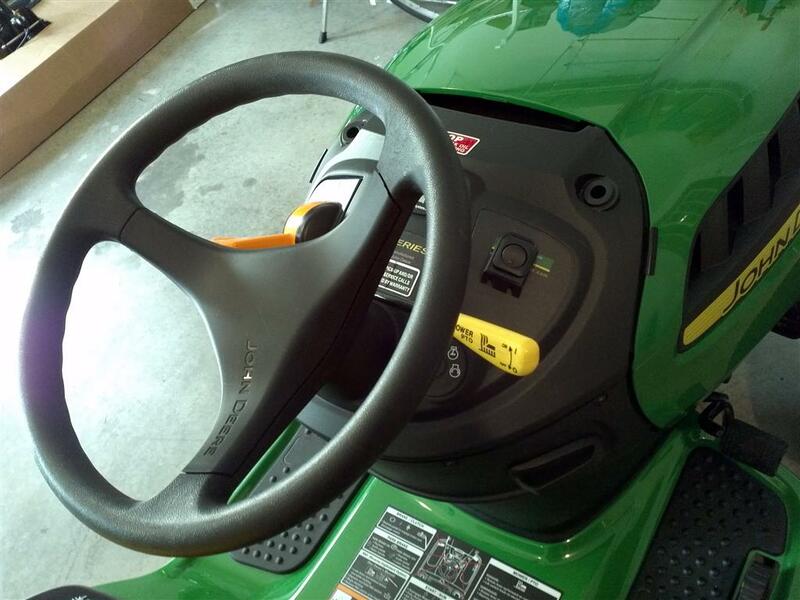 Two spindles of 42 inch and three-in-one mower are fastened of 12 gauge. They are made from steel which provides longer life. 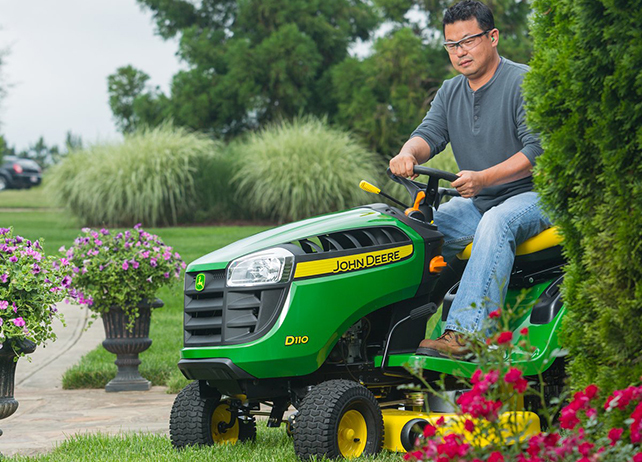 Deep-deck mower is designed for lifts grass for a clean, It can cut the grass even while the smooth underside prevents grass grow up and diffuse grass clippings. The design of rolled outer edge of the deck provides extra strength and protection. 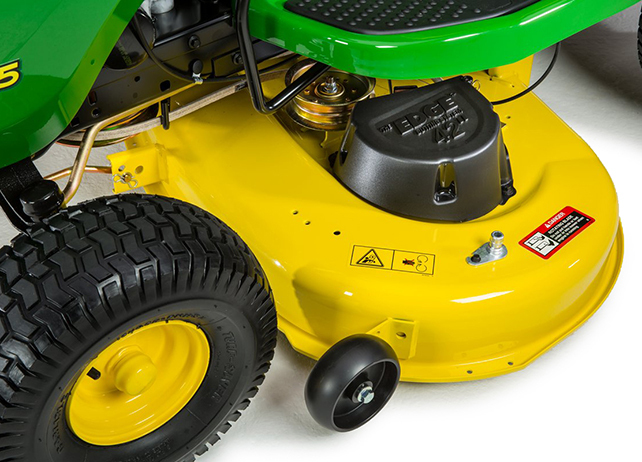 Mower deck posses dual-stage E-coat and powder paint coatings which provide extra protection from rust and it includes mower wash port for easy cleaning of the deck. The D110 Lawn Tractor has been upgraded from a dual drag link steering system to a single drag link steering system with tie rod design. This latest design will give you a much smoother ride and it will also extremely reduce tire and ground surface wear. Brand new D110 Lawn tractors are featured with silver headlights, as opposed to the traditional chrome headlights. This design feature performers light to be better distributed and giving you light where you need it most. 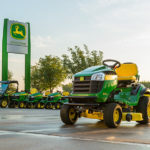 John Deere always considers the security of its customers and provides very effective service. D110 comes with 2 Year Factory Warranty or 120 hours, whichever occurs first (extended warranty available). Half the value of money of the product is the service and parts to back it up. 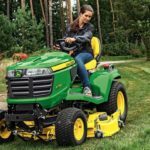 Overall John Deere D110 Lawnmower tractor is most efficiently and affordable in its class with high performance & low maintenance. You will be saving time and money and will get better resale value.